We have the right program for you! Choose a part-time program or a short program from our wide selection. If you don’t want to follow a part-time program, you can choose individual courses that provide the training you want. 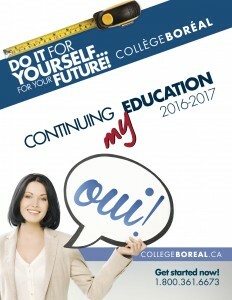 Collège Boréal offers professional upgrading workshops, one to three days in length. Training opportunities are provided according to community needs. Explore the possibilities. There might be a perfect match for you! A program for healthcare professionals! Check out the program description and contact us for further information. Are you missing just a few courses to complete your secondary school diploma? We have the program you need. Don’t hesitate to contact us for a consultation! Would you like to learn an exciting and well-paid trade? Check out our apprenticeship program and get in touch with us. We can help.